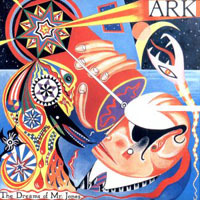 Perhaps best known for featuring bassist John Jowitt who would, of course, go on to bigger and better things with Jadis and IQ, Ark arrived pretty late to the 1980's neo-prog party with the brief, low-budget, pop-tinged albeit rather colourful 1988 release 'The Dreams Of Mr Jones'. Issued on vinyl and featuring a truly striking sleeve, this is virtually DIY prog from an enthusiastic five-piece with limited resources, but boy do they make the best of them. With no epics and a notable lack of virtuoso soloing, Ark's debut instead seeks to straddle the chasm between the pop and neo-prog genre's, lightly glazing a set of catchy tunes with a progressive aesthetic manifested by the occasional jerky time-signature and the album's unifying if somewhat loosely-delivered theme of love, life and the fantasies we indulge in to break the monotony of modern life. This refreshingly simple approach results in a slightly crude overall album, though the group manage to produce a couple of genuine corkers in the shape of the charming and highly-emotive ballad 'Through The Night' and the anthemic rocker 'Powder For The Gun', two tracks with real hit single potential. Elsewhere, the jaunty pop-rock of 'Mabeline' adds sprightly synthesizers and a catchy chorus to the mix, though unfortunately the under-nourished instrumental architecture of the maudlin 'Kaleidoscope' and the unconvincing closer 'Nowhere's Ark' struggle to reach the same exciting levels. Coming in at just under twenty-nine minutes 'The Dreams Of Mr Jones' really does rush by, yet despite the constricting budgetary limitations and sparsely-structured nature of the music this is ultimately a pretty entertaining ride. If it's catchy songs you're after as opposed to lengthy song-suites and ambitious musical constructs, Ark's debut album should be right up your neo-prog shaped street. Although slightly limited in scope and style, this does feature at least two excellent tracks, showing there are still occasional nuggets to be unearthed within the spectrum of 1980s British prog for those who dig deep enough. By no means a classic, but 'The Dreams Of Mr Jones' is refreshing fun all the same.